This is a different book from the usual Fireworks Magazine / Rocktopia fodder but certainly worth a mention. Sarah Tipper has produced a diary written from the perspective of a teenage girl but the big difference from this and Adrian Mole et al is that the girl (Cleӧ Howard) is a Metalhead. So along with the angst of teenage life, there are heavy references to Kerrang! magazine (the diary is set in 1997) and bands such as Megadeth, Alice Cooper and The Sisters Of Mercy. 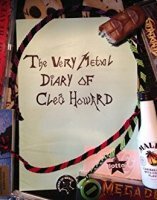 The diary is very endearing and although simplistic in structure (it essentially contains short diary entries from Howard on a daily basis) some of the situations and thoughts are handled very well such as death, love and the length of people's hair!